Location: Wheat Ridge, Follows Clear Creek south of Interstate 70 in Wheat Ridge. Many access points. 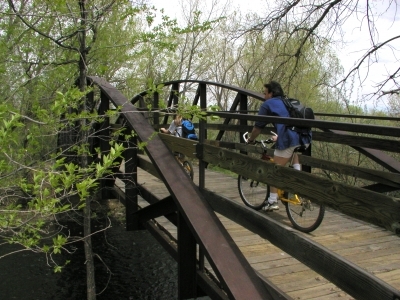 The Clear Creek Trail winds its way through five miles of the Wheat Ridge Greenbelt from Youngfield Street to Harlan Street. 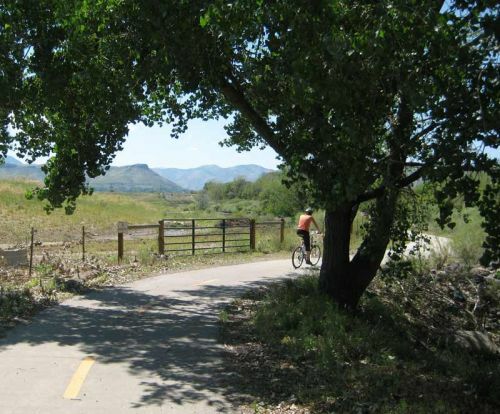 Long portions of the Clear Creek Trail hug the creek margin and lends to the feeling of passing through an eastern forest unusually for the arid climate of the Colorado Front Range. This no fee trail is accessible to everyone and passes by four lakes providing bonus opportunities for both bird and wildlife viewing by trail users. Bikers on bridge. Photo by Margaret Paget.